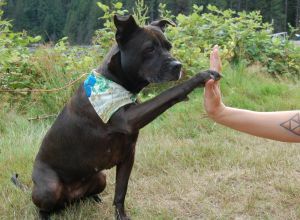 Pyper | Staffordshire Bull Terrier in Vancouver. Pyper is a friendly but aloof rescue dog. She is a little big sister to a cat and a big sister to two rats. She's been a foster sister to 9 dogs of different breeds, sizes, and personalities. She prefers walking buddies over dog park dates. She loves food and adventuring through forests and along beaches. She dislikes hyper dogs and getting wet. Pyper is an easy-going dog for someone looking for dog company or looking to get more experience with dogs before getting their own. We're also happy to walk with leash reactive dogs who need more exposure. I am an Interior Designer for a development company in Canada. We are active on Instagram (@pb.and.gay). I joined to meet other dog parents.